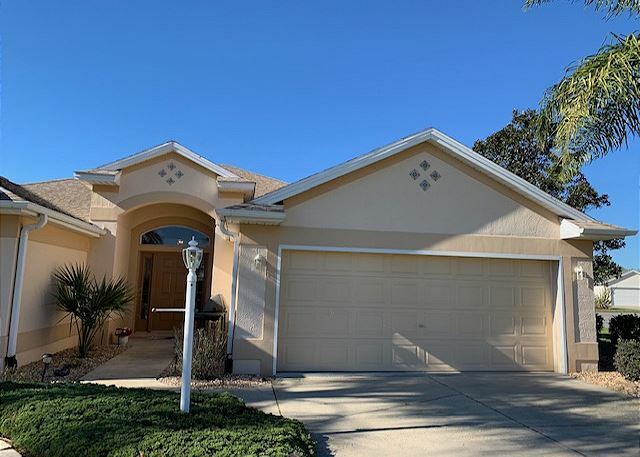 The Villages, Florida United States - SWIM SPA CORNER LOT DESIGNER HOME THE VILLAGES FL 1 HR FROM ORLANDO | RE/MAX PREMIER REALTY Inc.
Lovely home on a corner lot in a great location with a golf cart!. This home is located in the Village Santo Domingo. Just minutes from Spanish Springs Square. Three bedroom two bath home, tile floors in main living area. Breakfast bar with two stools, eat in kitchen for 4, dining area seats six. Master has king bed, queen in guest room one and twins in guest room 2. Large open kitchen into the dining and living area, foyer entrance. In the lanai you have seating and dining perfect for entertaining. A guest from The Villages, Fl United States recommends this vacation rental.